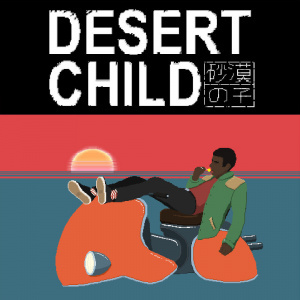 Sorry, no review of Desert Child yet. In Desert Child, you are a young and talented hoverbike racer who needs to figure out how you can scrape enough cash together through racing and odd jobs to punch your one-way ticket to the Red Planet to enter the biggest race in the universe, the Grand Prix. The world as we know it is slowly starting to become uninhabitable, and many people on Earth have moved to Mars for a better quality of life, thanks to a government subsidy that assisted in relocating citizens by providing affordable passage. After several years of running this program, the government announces that in two weeks, tickets to Mars would go up in price, making the exodus to the Red Planet unobtainable for regular citizens. You’ll deliver pizzas, collect gun parts, hunt bounties, and make some fans along the way. In between races, you’ll explore colourful cities where you can repair and upgrade your bike, dine on the local cuisine, and fight your way through gangsters, bounty hunters, and all sorts of interesting characters, just so that you can have a decent meal and keep your bike running. This game is super awesome, if you think you’d like it you probably will. If you like hip hop, Sci Fi and old computer games you’ll love this! I give it 10/10 personally.